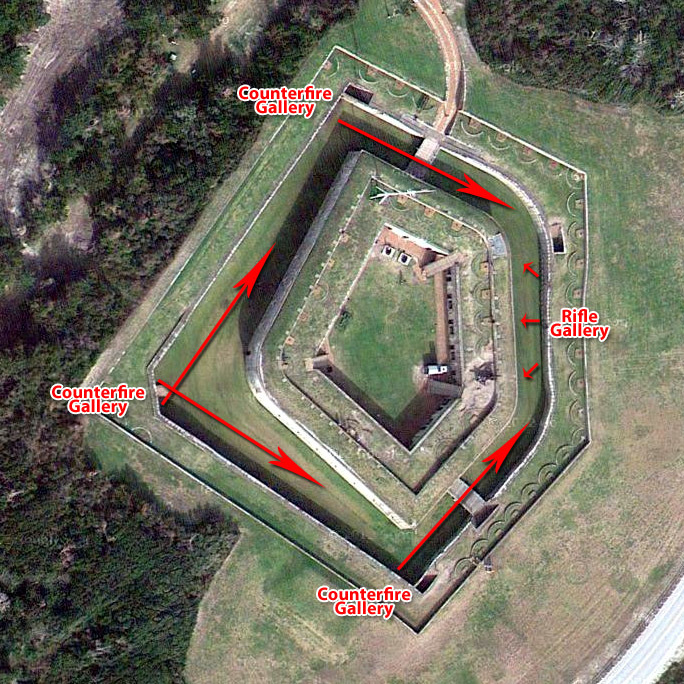 A cute diagram of Fort Macon's Counterfire Galleries and their capabilities. The design of this fort seems weird to me, and not just because it's not in the shape of a star. The center part is essentially a citadel, with no real means of defending itself from the safety of the casemates: In my experience, a casemate is built to either house an individual cannon or serve as a shelter. Each of Fort Macon's casemates has a relatively small opening, and was designed to be defended with rifle fire...sort of. There is evidence that, at one point or another, bigger guns were intended to be mounted in some of the fort's inner casemates. More on that in a bit. Regardless, the concept of the counterfire battery, while certainly delightful, would have been unnecessary if Fort Macon were built as a proper starfort. Although starforts often have caponnieres, which perform essentially the same function as a counterfire gallery. Anyway, a lot of thought obviously went into what would happen if an attacking force got into the ditch.